A very quiet Thursday night with just 2 New York Islander prospects in action as we get ready for the final pushes for playoff positioning by the prospects and their team. As much as we hate it we will also be saying good-bye for the season to a prospect or 2 as their season could be ending. Jesse Graham (NYI 2012 6th) just might make me eat my words about him not earning an Islander contract after he followed up his 4 assist performance on Tuesday with 3 more helpers on Thursday evening. 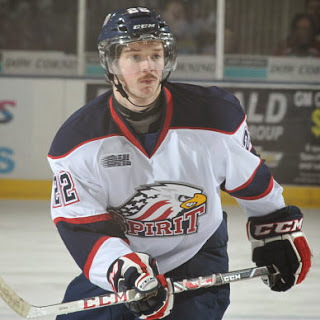 Graham and his Saginaw Spirit were on the road visiting the Windsor Spitfires as Saginaw is trying to catch Windsor in the standings for 6th place. It is a long shot as Saginaw entering the game trail the Spitfires by 8 points with just 5 games left. Saginaw earned a 8-3 win and cut the Spitfire lead to 6 points with 4 games left (Windsor has 5) but the Spirit did extend their lead over Owen Sound to 5 points. Graham is on fire this week as the game's first star started his night off by firing a shot that just missed the inside of the left post but the rebound came right to Dylan Shadowy who tapped it into the empty net for a 1-0 lead for Saginaw just 2:07 into the game. Assist number 2 came in the 2nd period when with the Spirit on the power play, Graham fires a point shot that Jimmy Lodge tipped in for Saginaw's 4th goal of the game. Graham's 3rd assist would be a secondary one on the Spirit's 6th goal which was a shorthanded goal. Graham with back to back first stars thanks to 7 assists over his last 2 games is now 11-41-52 which puts him 4th among OHL defensemen in scoring and just 3 points behind the Islanders leading scorer this season Ryan Pulock. Not bad Graham not a bad job at all. Victor Crus Rydberg (NYI 2013 5th) and his Plymouth Whalers are playoff bound after they edged the Niagara IceDogs on a late goal 4-3. Crus Rydberg had a secondary assist on Plymouth's 3rd goal of the game which came at 19:06 of the 2nd period. It was a power play goal which gave Plymouth a 3-2 lead at the time but they would go on to win. The Whalers clinched the 8th seed in the OHL Western Conference and their reward for that is getting to face the Guelph Storm in the first round of the OHL Western Conference playoffs but let's save the gloom and doom for a week. Crus Rydberg improves to 11-24-35. Please take a moment and offer a prayer for Kootenay Ice forward Tim Bozon who is in critical condition in a Saskatoon hospital suffering from Neisseria Meningitis. Bozon who is a teammate of Ranger prospect Mackenzie Skapski has been in the hospital trying to defeat this disease.